Pandangan Ikhlas TMJ Cetuskan Kemarahan Penyokong Mahathir? Assalamualaikum and peace be upon you. I would like to take this opportunity to send a message and express my views to the beloved people of Johor. I’m giving my advice and sharing my views not as a politician, but rather a message from my heart as a young prince serving his people. 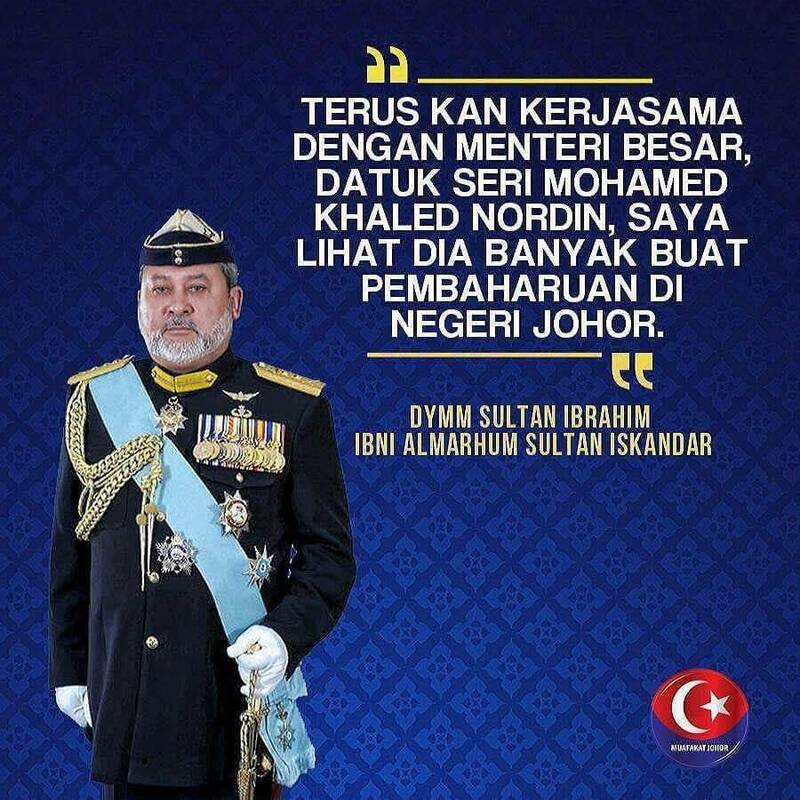 My loyalty is to my Sultan, the state of Johor and to my fellow Johorean. HM The Sultan of Johor and I have shared our views and initiatives for what is best for the state of Johor in the future. All aspects have been taken into consideration which not only covers the governance of Johor, but also the blueprint to make Johor an economic powerhouse in this country. Along with this, we’ve also addressed issues to tackle extremism as well as upgrading the educational system and healthcare. With the political senario that is currently happening in our country, regardless whether or not it’s the ruling government or the opposition, the people must be smart in evaluating what is best for our state and country. Currently, the people are only hearing what the politicians are saying through their speeches or reading articles circulating on social media. The ones who know the real situation is HM The Sultan of Johor and myself. We know their secrets and agendas. Everyone is well aware that when a politician wants something, they will make sweet promises. I am not a politician but I too have my own agenda, and my agenda is to ensure the sovereignty and the welfare of the state of Johor. Everyone knows that UMNO was formed in Johor. In a Johor’s state palace to be exact. I know the people are discouraged by the leadership of the country and I understand. In my view, UMNO needs to have more assets than liabilities. It means UMNO needs to revamp the way it governs, change the way it thinks and it's policy. One important factor in my opinion is the current party’s hierarchy system. We need more assets in the form of young talents who are ready to serve the country and share their knowledge and replace the old guards with those who have these potential. I will never forget those who damaged UMNO. 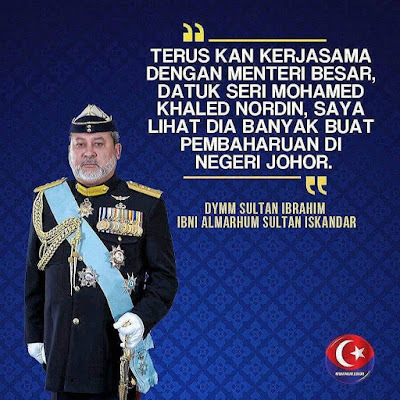 The forerunner who gave birth to cronyism, those who gave birth to corruption and proxies, those who wanted to strip away the power of the royal institution and those who attempted to disband our beloved Johor Military Force (JMF). Do not question the sovereignty of Johor. We have been established since 1885. In the early days of the formation of Malaysia, the central government learnt protocols, adopted the structure of governance as well as the constitution from us. We were the first state to have our very own constitution and has been a model to other countries. We should not blame the whole organisation or party because of one problematic individual. I won't forget the year 1992. Back then I was a small and naughty kid in school. My teachers will say, "Do not play a fool, you are royalty, if I were to report you to Mahathir, you are done for ". Same goes for the story of Private Adam, where my late grandfather, Almarhum Sultan Iskandar was not given a chance to defend himself. Back then we did not have the luxury of the internet and all media were controled by the government. The media reported that Private Adam apparently “ran amok” when he got news that his brother was murdered by the Sultan of Johor. Private Adam did not have a brother and only a sister who perished in a fire at home when she was 2. Last year I met an individual from Kedah who told me that he met with Private Adam who told him how he was forced for 10 straight days in a dark cell by policeman and confess that the Sultan of Johor had killed his brother. This is how low the highest government’s leadership then is willing to go to have absolute power in this nation. I hope the people are not easily fooled by a forked tongue individual. At the moment he is not trying to save the country, he is more worried of what will happen to his children in the future. Even the wealthiest person on earth would not be able to give birth to three 'billionaires'. My advice to the people of Johor is, if you have a problem with the government then raise your voice and let them know what you want. All of you have me and the HM Sultan of Johor to convey the peoples voice to the highest leadership in the country. Never for once think that we have no initiative to fix the system within the government. HM Sultan of Johor and I have agendas and plans. Our main agenda is the state of Johor, but how we reach Putrajaya, we can’t disclose to all of you as it is private and confidential. I do not any political party, but in order to change a country’s fate and improve the system, it is not by bringing down a government. We need to change it from the inside. Our neighboring countries and I believe that if a ship has been sailing fine for many years but has an issue due to its skipper, do not fix it with a new engine. We stay on the same ship and guide the skipper to where we want to go. That’s all I’m sharing with the people. But the people of Johor must believe in the vision of HM Sultan of Johor and I. I do not need to show many examples. Just one small example is enough for me to illustrate for you. administration. What I did was I changed the constitution whereby instead of investing in the FAM, we invested in all the teams and we took care of the interests of Malaysian Football League (MFL), no longer the FAM. This was why I left the FAM because the power is no longer with the Football Association just like in other countries. The power is with a neutral body that manages the league just like in LaLiga (Spain), Serie A (Italy), English Premier League (England), Bundesliga (Germany) and now in Malaysia. It’s called the MFL. Don't misinterpret it by thinking that the President of the FAM is a proxy. He is not a proxy but an individual who is qualified and can work together with the MFL. Once again, the modus operandi is simply my training before partaking my bigger agenda which is the highest levels involving the state and federal administration. At the moment, the political situation in the country is a bit messy, but it is not the end of the world. This is the time to restore the orders and implement systems that have been damaged by individuals who are dreaming of becoming Prime Minister. Do not be deceived, open your eyes, use your minds and follow the clues I have given because I know things you don't know. You only have to trust me, I know what I am doing. This is the time for the South to take control of the situation that has been damaged by money and power greedy individuals and stear it in the right order. Do not be easily manipulated into believing whatever you heard last night in Pasir Gudang. Johor state will never forget that individual who tried to disband the Johor Military Force (JMF) an organisation that has stood since 1886 and that same time, dreaming of diminishing the Sultan's power, belittling our constitution that has been here since before the inception of the country called Malaysia. To my beloved people of Johor, we must remember that United we stand, divided we fall. As long as the people of Johor are together with HM The Sultan of Johor and I, we can achieve anything for the future of our children and grandchildren. Do not be easily played by the bad influences out there who want to destroy the sovereignty of this state. Look at what I have done for football. It is merely training at driving range before the real tournament. Don't change the boat if the engine is not broken, don't even change the skipper but allow HM The Sultan of Johor and I guide the skipper for you. Change what needs to be changed and upgrade what needs upgrading for the sake of our beloved country.